An interceptor sits underground at Fort Greely. Photo: U.S. Army. 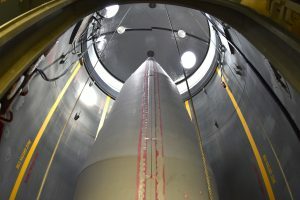 President Trump revealed his new missile defense plan Thursday, and he highlighted the role of Fort Greely. But those 20 interceptors are already being built. Fort Greely, near Fairbanks, is the center of the nation’s ground-based missile defense system. Forty missiles are there now, and Congress previously funded 20 more. Last year, Boeing signed a contract to build those missiles and their silos. “Those are going in,” U.S. Sen. Dan Sullivan confirmed. Sullivan said “it was a little unclear” whether Trump was referring to an additional 20, beyond the 20 underway now, but after scouring the plan, Sullivan determined he was not. But the senator said the plan is nonetheless significant for Alaska. The report notes that Fort Greely has room for up to 100 silos. And Sullivan said the president’s focus on missile defense is itself a big deal. The plan calls for adding sensors and other technology in space. Sullivan said those systems will improve the capability of the Alaska-based interceptors. The missiles at Fort Greely are intended to knock out incoming enemy missiles in midcourse. The system has been likened to hitting a bullet with a bullet. Critics say it’s too expensive and has performed poorly in tests.